I’m keeping this simple. I have a tendency to complicate recipes, I guess that comes from baking so much, But I get it that most people have some kind of life outside their kitchen! You will need a couple of ingredients that you might not ordinarily have. I use brown rice syrup. It is not available everywhere, but you can get it online, Ocado do it and my favourite www.healthysupplies.co.uk have it amongst everything you could possibly want in life! Oh and Sainsbury’s are doing it now too. Look in the baking aisle – it is the Sarah Wilson ‘I Quit Sugar’ brand of Rice Malt Syrup. Brown Rice Syrup is great stuff. Due to its very low fructose content, scientists now believe that the consumption of large amounts of fructose can rapidly induce insulin resistance, postprandial hypertriglyceridemia, and blood pressure in humans more than starch (or glucose) does in controls. Moreover, it is a potential risk factor for fatty liver disease. 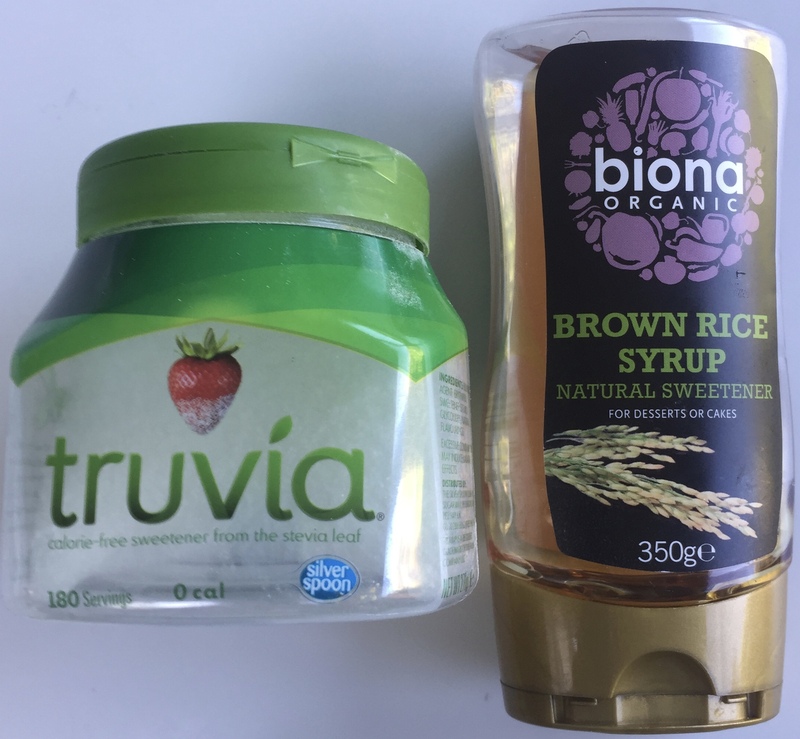 So brown rice syrup is a much, much better choice than the fructose-laden syrups such as fruit syrups, date nectar and agave syrups you find masquerading as good-for-you in the ‘healthy sugar isle’ of your supermarket or health food shops. You could substitute the brown rice syrup for any syrup you might have, as long as you don’t mind the extra sugar… it won’t be much more as I use only 50g for the whole batch. The syrup keeps it all moist. For the granulated sweetener, you can also use xylitol (derived from Birch tree Bark), erythritol or Stevia. Stevia really needs to be combined with erythritol as it can have a bitter aftertaste. Silver spoon do a good one already combined.It’s available everywhere these days, Have a look in the sugar aisle of your supermarket. You will need some kind of brownie tin. I use one that has two inch high sides and is 10”x8”. Smooth some butter or coconut oil all over your tin and then line the base with baking paper. 200g Ground Almonds or ground pistachios or a mix of both, I like to use ground almonds and a handful of roughly chopped pistachios thrown in for good measure. Slop your very soft butter (not melted – but extra soft) sweetener and brown rice syrup into a large bowl and give it a good mix until the mixture turns pale. I just use a wooden spoon for this – I like a bit of old skool – but use your stand mixer if you feel the need or handheld version. Add the rest of the ingredients. Yep, just bung them all in and mix until just combined. Remove and allow to cool in the tin. Turn out and slice into 16 slices – depending on how big you like your squares.